Heat oven to 350°F. Spray 24 regular-size muffin cups with cooking spray. In large bowl, mix Cookie Base ingredients with spoon until soft dough forms. Using rounded tablespoonful of dough, shape dough into 24 (1 1/4- to 1 1/2-inch) balls; place in muffin cups. With thumb, make indentation in centre of each. Bake 12 to 14 minutes or until light golden. Meanwhile, in medium bowl, beat cream cheese and sugar with electric mixer on medium speed until smooth, scraping side of bowl frequently. Add egg, beating until just blended. Beat in vanilla. With end of wooden spoon, reshape indentation in centre of each cookie to create 1 1/2-inch opening in each. Clean off end of wooden spoon with paper towel as needed. Spoon slightly less than 1 tablespoon filling into each cookie cup. Bake 8 to 10 minutes or until center is set. Cool 10 minutes in pan on cooling rack. Run knife around edge of each cookie cup to loosen. Cool completely in pan, about 30 minutes. Remove cookie cups from muffin cups. Refrigerate 1 hour. 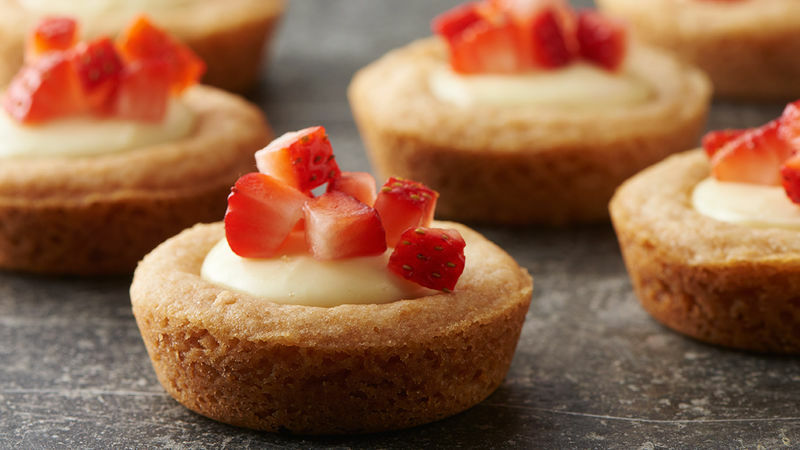 When ready to serve, top each cookie with 1 heaping teaspoon chopped strawberries. Store covered in refrigerator.